The “NOlimpia” drive by Hungarian political opposition group Momentum Mozgalom to force a referendum over Budapest’s bid to host the 2024 Olympic and Paralympic Games is quickly gaining speed only five days after the launch of a signature collection campaign – and it has caught the Mayor’s attention. Referendum advocates had already collected as many as 50,000 signatures by Monday. AFP reported, that’s more than one-third of the way to the 138,000 names that are needed to trigger the scheduling of a municipal vote over the bid plans. Reports and social media accounts have described queues forming at several signature collection booths around the city over the weekend while citizens wait their turn to sign their names on special forms that were provided by the municipal elections board. NOlimpia still has another 25 days to collect the remaining signatures. Other opposition political parties in Hungary have joined in on the campaign that intends to derail the Olympic bid, leaving only Los Angeles and Paris in the race that is set to be decided by the International Olympic Committee (IOC) September 13 in Lima, Peru. Though calls for a referendum were made repeatedly last year, the current NOlimpia campaign is the first to gain traction – and the attention of city officials. 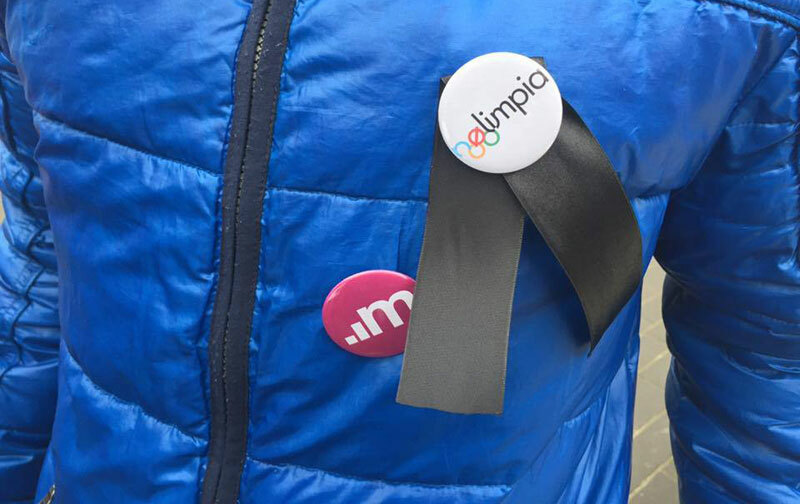 Budapest mayor Istvan Tarlos told the M1 news channel, “whoever loves Budapest supports the Olympics and doesn’t sign these forms”. He said the Hungarian sportspeople “deserve” the Games, insisting that Budapest “would do well” out of hosting the Olympics. Campaign leader András Fekete-Győr told GamesBids.com last week that money shouldn’t be spent to organize the Games. Fekete-Győr has been in contact with Chirs Dempsey, the creator of “No Boston Olympics” who rallied his city’s residents to reject a run at the Olympics in 2024 because of the negative financial impact it would have. Massive public opposition forced officials to cancel bid plans and the United States Olympic Committee (USOC) instead chose Los Angeles to pursue the opportunity. Dempsey told GamesBids.com that he spoke to members of NOlimpia in Budapest by phone last weekend to discuss their plans. NOlimpia said they had also been in touch with referendum advocates in Hamburg hoping to benefit from lessons learned when the German city’s bid for the same Games was toppled in a November 2015 referendum. Budapest 2024 revealed a poll last week that showed 63 per cent support hosting the Olympic Games, but that doesn’t guarantee a referendum victory. Hamburg’s loss followed polls that demonstrated over sixty per cent support. The bid has consistently confirmed that they support open discussion about the bid and have provided, and will continue to provide public forums for debate. Momentum Mozgalom is a youth political group who oppose the policies of Hungarian Prime Minister Viktor Orban, a staunch advocate of the bid. The group has said that it could put forward candidates to run int the 2018 parliamentary elections. Four of six applicant cities ended their plans to bid for the 2022 Olympic Winter Games before the final election, forcing IOC members to choose from among only two candidates. Rome canceled its bid for the 2024 Games in October after the city’s newly-elected mayor Virginia Raggi said plans were “irresponsible” and money should be spent instead of essential city services. If Budapest’s bid were to be defeated, the 2024 field will have been reduced from five to two candidates underlining the IOC’s ongoing failure to convince taxpayers that organizing an Olympic Games is economically feasible. The third and final set of bid documents are due into the IOC February 3, An evaluation commission is due to visit Budapest May 10 to review the bid dossier and tour proposed venues.